I am so excited to share my all time favorite body butter with you guys! It’s The Body Shop Cocoa Butter Body Butter. I have yet to find a body butter that works as well as this one. I’ve tried countless products and brands and this one stays steady as my #1 pick. The Body Shop is known for it’s ultra effective, ultra decadent body butters, and this formula is definitely their best one of all. It is even richer and more moisturizing than their other scents. If you’re new to the Body Shop Body Butters, start with this one. Cocoa butter is known to improve skin’s elasticity, resilience and tone. It also deeply hydrates and leaves your skin conditioned and ultra soft. Cocoa butter is also used by many women who are pregnant, as it is said to help prevent stretch marks as well as itchy skin – two common pregnancy side effects. I found out I was expecting my first baby back in July and I’ve been using this body butter daily. My sister gave it to me as a gift, and I couldn’t be happier with it. I just reached my 8 month mark yesterday (yay!) and can definitely say it has helped sooth itchy skin. I also have NO stretch marks so far (crossing my fingers!). The potential for stretch marks does have a lot to do with genetics. Some women will get them no matter what, but for other women, using a deeply conditioning moisturizer that works all day can help a lot to prevent them, whether you’re expecting a little one or not. This body butter truly lasts a full 24 hours. I recommend applying it right after your morning shower, while your skin is still damp. A morning application alone delivers smooth, supple skin all the way until the next morning. Being pregnant, I’ve been extra diligent and have sometimes applied it again at night just on my tummy, but that’s me just being extra careful in wanting to avoid stretch marks from developing. Normally, one application in the morning is plenty. Also, depending on your skin type, it doesn’t necessarily need to be used daily. For many people, using this just once or twice a week will work wonders. If you have very dry skin, try using it daily to see the difference. For normal to dry skin, try using it twice a week. It is also a great product to use solely for areas that really need it. Try using it just on your elbows, knees and feet. It will really help soften up areas that have become calloused and rough. Like most body butters, this will take a bit to soak in. I usually give myself 5-10 minutes before dressing. If you’re applying it weekly, try doing it on a day when you wash your hair and let it soak in while you use the hair dryer. By the time you’re done, you’re good to go. I’ve used other body butters that took hours to absorb. Yes, hours. My skin would feel greasy for so long. The results were great, but the wait time was too long for me. With this Body Shop Cocoa Butter, you get the best of both worlds: unbeatable results and less time waiting for it to soak in. I love the scent. It is a sweet, cocoa scent that isn’t overwhelming. It is a soft scent and can easily be worn underneath a regular perfume without competing for attention. A little goes a long way. This product is rich and dense. You can use a little amount and it will cover a large area. Many drugstore brand lotions and butters have higher water content and so you’re actually getting a lot more for the price with quality body butters like these. The body butters also come in two different sized tubs (a large 13.5 oz. tub for $36, and a regular 6.7 oz. tub for $21). Some of them even come in a little travel sized container. I love having options. Since I travel quite a bit, it is a huge plus when products are available in a travel size. It is pretty easy to find these on sale, so at the sale price, these are more than worth it for me. For the best selection, BUY IT HERE, directly from The Body Shop website. Regularly $21, they’re on sale right now for just $10! Shipping is free too! They also have frequent sales where you can get the regular sized tub for $12 or so, but $10 is the lowest I’ve seen them. Also, The Body Shop has insane Black Friday deals. This year they had all their body butters, regular or large tub, for $10 each. I stocked up on a ton of body butters this year, so I’ll keep you guys posted on what they have for next year. If you like their products, Black Friday is one of the best times to get your fix. I’ve also had luck finding Body Shop Body Butters at TJ Maxx at a discount. You can get the large tub sizes (regularly $36) for around $10. It seems to be hit and miss though, so I try to stock up when I see them on sale here. If you end up trying this product out, let us know what you think! Gosh I haven’t shopped at The Body Shop in years. I love they have natural options too. I will be going there next time I am at the mall. I really used to like them. I love there cocoa butter product! I have not shopped here in a very long time. Would love to try this product! I don’t think I have ever bought anything from The Body Shop. I would love to try this. The smell of Cocoa would be great. Will have to try this product!! I have dry skin & have yet to find anything that works without feeling sticky! Thanks for the review! I haven’t used this body butter in a long time! It used to be a hard he favorite of mine until I started having medical skin issues and had to switch to a medicated lotion. Now that my skin is healthy again I’m definitely going to try this again! Thanks for reminding me of an oldie but goodie I had totally forgotten! I like using body butters over lotions. I will be trying this one out. Thanks. Love thanks for the review will definitely check it out ! It looks so rich and creamy! I love cocoa butter & I love The Body Shop’s products. I love Cocoa Butter and The Body Shop is one of my favorite stores! I love cocoa butter! I use it right out of the summer during the winter because it’s so dry in my house. When you apply while your skin is still wet, it locks in extra moisture which helps so much! This sounds like a great product. I love The Body Shop…. I love this body butter! It smell amazing and leaves my skin feeling so healthy. Oh my gosh. I had this a few years ago but then I could never find it again. Of course then it might of just been when they started so it was cheaper but I’m 100% sure it’s the same thing because I kept the container hoping to find it again. This sounds heavenly! Almost good enough to eat! But not quite! I live Aloe and Cocoa butter. I love the smell of cocoa butter! I have really dry skin. Im going to try this. I love cocoa butter so I’m sure this product is amazing, can’t wait to try it! Cocoa butter looks so good for the skin.. thanks for sharing. latly i have been taking better care of myself and i think this looks really luxurious and fun! A Product that I may have to definitely try. I bet this is AWESOME! I love shopping there! Thanks for sharing! Really interesting information. I have some body butter but always figured it was just a fancy name for lotion. I didn’t realize that it is quite different and has different ingredients. I will have to try this. Thanks for this review. I’d love to try cocoa butter on my scars to see how they fare. I’ve never been to The Body Shop. I’d love to try this. Thanks for posting! Thank you for sharing I will give it a try. This is my all time favorite body butter from them! Been using it for years! I love the products from the Body Shop! I’d love to try this product, I love cocoa butter! I love the smell of Cocoa! Thank you for sharing. My sister buys things from the body shop and she really like their products. This sounds good, never ordered from The Body Shop. I have been looking for a good cocoa butter. I am a big fan of Body Shop’s products and this sounds good! I have never shopped at the Body Shop, but this sounds amazing. The scent sounds heavenly. i love the smell of cocoa butter, I used it through all my pregnancies! I will try this product the next time I visit The Body Shop. Thisbody cream cocoa butter sounds like one I would love the scent of.t would be great to try this for my dry skin. This sounds great. I really enjoy cocoa butter products. 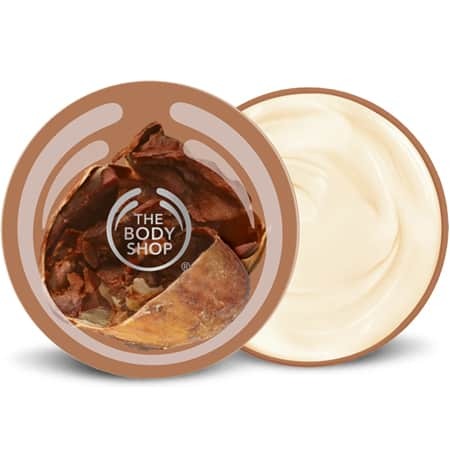 I just LOVE Body Shop Body Butter – so creamy! Thank you for the review. I would love to try these products. I love Body Shop body butters and this one is one of my favorites – smells great and is very effective. Hi Maria! This post is a review of the product, not a freebie offer. 🙂 Our freebies are located on this page. I just love The Body Shop! Their products are so nice and I’ve been able to find relief for very dry feet as well as dry hair caused from graying. I haven’t tried their Body Butter, but will keep your review in mind for my next order. I bought this when it first came out. I haven’t been able to find it since. It smells so good. I have to fin me some. I used The Body Shop body butters when I was pregnant too! I think I used the Mango one. I don’t remember the Cocoa Butter. This sounds so good. I haven’t purchased anything from The Body Shop in quite awhile, I guess it’s time to restart.